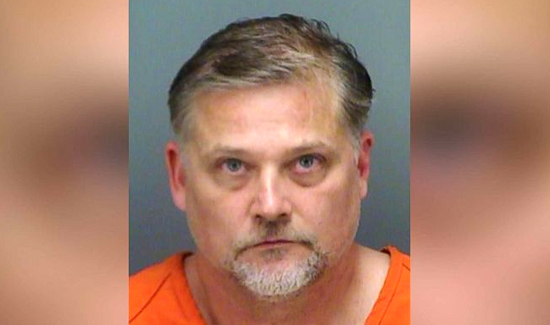 A Florida man allegedly fired his shotgun at rodents dwelling in his backyard after authorities were called to his property on Sunday, police said. Stephen Jonas of Palm Harbor, Florida, (pictured above) allegedly took his .223 rifle and fired off five rounds early Sunday morning, authorities said. At least one bullet struck a neighbor’s backyard, according to a statement by Pinellas County Sheriff’s Office. No one was injured, police said. Deputies set up a perimeter around Jonas’ home and evacuated the neighbors. A Pinellas County Sheriff’s Office spokeswoman told ABC News police attempted to use a PA system to get Jonas to come outside and surrender. But Jonas had apparently fallen asleep for eight hours, the spokeswoman told ABC News. The deputies were finally able to connect with Jonas, 51, who was impaired when he “walked out of his home and was taken into custody without incident,” according to the police statement. A further search of the home turned up “many other weapons” that the spokeswoman described as at least 15 rifles, handguns, one shotgun and 1,300 rounds of ammunition. All were confiscated as evidence, she said. The spokeswoman also said that Jonas possessed more than 30 grams of marijuana and over 30 grams of pills that were believed to be Xanax. He faces one count of shooting into an occupied dwelling as well as felony possession of marijuana and felony possession of a controlled substance, the spokeswoman said.